Controlling your home from afar is easy but expensive with ADT’s new app-based monitoring system, ADT Pulse. Controlling your home from afar is easy but pricey with ADT’s new app-based monitoring system, ADT Pulse. ADT Pulse pumps new life into the standard ADT home security system by giving you control of your environment from your smartphone—or you can use Amazon Alexa’s voice commands. And don’t worry, there’s still an in-home control panel too. Feel the sweet relief of air conditioning the minute you step in the door by turning it on before you get home. Lock the doors and turn off the house lights without getting up from the couch during movie time. Or watch your dog chew up that same couch while you’re at work using the live video stream. With Z-Wave compatibility, ADT Pulse keeps up with our other Best Wireless Security System providers like Vivint SmartHome or Frontpoint—but you’ll pay more with ADT. Don’t bother driving back to your house or calling your neighbor if you forgot something. You can switch off the lights or AC yourself from your phone. And if you really need your neighbor Wilson to check on something, you can lock and unlock your doors using ADT Pulse’s app, too. This isn’t necessarily anything different from other companies smart home features, like Vivint or Frontpoint, but it is nice to see ADT, which has the longest-running player in the home security game, bring home automation to its lineup. 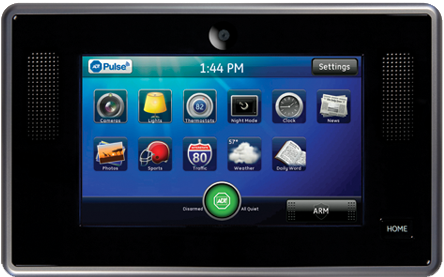 ADT Pulse’s hub (or control panel) is the heart of your system: You won’t miss a beat if an alarm goes off or if a device quits functioning because you’ll get in-home alerts on the control panel and notifications from the app to any connected mobile device. With active monitoring, you’re not the only one monitoring your system either—ADT has six nationwide monitoring centers (Xfinity Home has six, as well, but Vivint has two). ADT Pulse uses cellular technology and battery backup, so you don’t need to connect to your home phone. So during those crazy thunderstorms or grid outages, you won’t have to worry about finding a power supply to silence any beeping or keep your security system up. While cellular isn’t anything new or unique, we do highly recommend it. ADT Pulse lets you remote arm and disarm, so you don’t have to run out of the door like you’re Indiana Jones escaping the boulder trap. With the mobile control, you don’t even have to be inside your house to arm it. Or if an alarm goes off unnecessarily, you don’t have to run up and punch in a key code—just pull the app up or holler at Alexa, and move on with your life. It’s all a matter of preference, some of us like the app, others use the key fobs, but some of us still like using a number code instead. If you hate juggling your grocery bags, your new succulents, and your house keys while trying to open the door, then take advantage of remote access and unlock your front door before you even get out of the car. With the live video feed, you can make sure your dog hasn’t chewed up the couch—or check in on your family as they act out the most boring reality TV show. On the more serious side of things, video evidence can be helpful against package thieves, vandals, and other troublemakers—like racoons. ADT Pulse offers indoor, outdoor, and doorbell security cameras, so you can keep an eye pretty much anywhere you need to without having to integrate another security company just to look at your video stream. ADT Pulse is a few more bucks per month than standard ADT home security service, but the price of the convenience is fully worth it. However, if price is more your concern, you can get away cheaper with Vivint or Frontpoint, where monthly monitoring costs cap out at $50 per month. You can get a decent DIY Home Security System for $200–$300, but then you won’t have professional backup should an emergency arise. Remember, you’ll be locked into a 36-month contract at these prices. Or you’ll face paying 75% of your remaining contract to go without the service, which isn’t much better. If you go with a DIY provider, your contract can be month to month or annual. Or if you go with similar professional monitoring providers, you’re looking at least a two-year contract with XFINITY Home, or 42- or 60-month contract with Vivint. The $99 installation cost for ADT is pretty standard, but you should expect to pay extra for each camera you add to the system. It costs $25 one time to send that magic power to your ADT Pulse system. Other providers like Vivint charge up to $99, so Pulse’s activation fee is comparatively cheap. If you hate the idea of paying installation or activation fees, you should check out DIY providers like Frontpoint. If you’re familiar with ADT’s basic home security packages, you know you usually get a control panel, a couple of door and window sensors, and a motion detector. That’s mostly to keep the bad guys away, but ADT Pulse makes your house cozier, your daily tasks more convenient, and your life just a little easier. ADT Pulse doesn’t support Zigbee devices, but then again, neither do Vivint and Frontpoint. There are workarounds, though: you can buy a smart hub that supports Z-Wave and Zigbee devices. If you absolutely want to use Zigbee devices without compatibility problems, check out XFINITY Home or Samsung SmartThings. Home security mobile apps basically take your old-school control panel and throw it into a more convenient digital interface. You’ll get a timeline of events, access your video feeds, and the ability to check on any part of your system—from anywhere, not just from your kitchen. You should always leave your outside door notifications on when you’re away, but you can turn them off if you’re going to be home during a party where you don’t want your phone blowing up every time somebody comes back with even more Choco Tacos. How does Amazon Alexa work with ADT Pulse? For chatterboxes and other people who prefer to use their voices, adding Alexa to ADT Pulse is one of the easiest things you can do to stay safe. For more info, check out ADT’s Alexa page. If you’re used to asking Alexa to play NPR for the dogs while you’re away, then you’ll also like being able to chat with her about your home security system. Although it’s not a riveting conversation, you can ask Alexa to arm and disarm your system, check the system’s status, and control your locks, garage door, or other home automation features. So if price isn’t a huge factor for you, you’ll love that you can connect to any Z-Wave device, use Amazon Alexa’s voice commands, and control everything from your lights and temperature to your security system and door locks with a single app. And once again, with ADT being the oldest player in the game, thieves and neighborhood punks will see the signs, recognize the security name, and hopefully skip right past you. Have you tried Pulse? Help us stay on beat by letting us know what you think! What is Wireless in Home Security?